As a choir, the “Phil” has a history to be proud of. We have brought great music to the people of Coventry for seventy years, performing in various venues round the city. 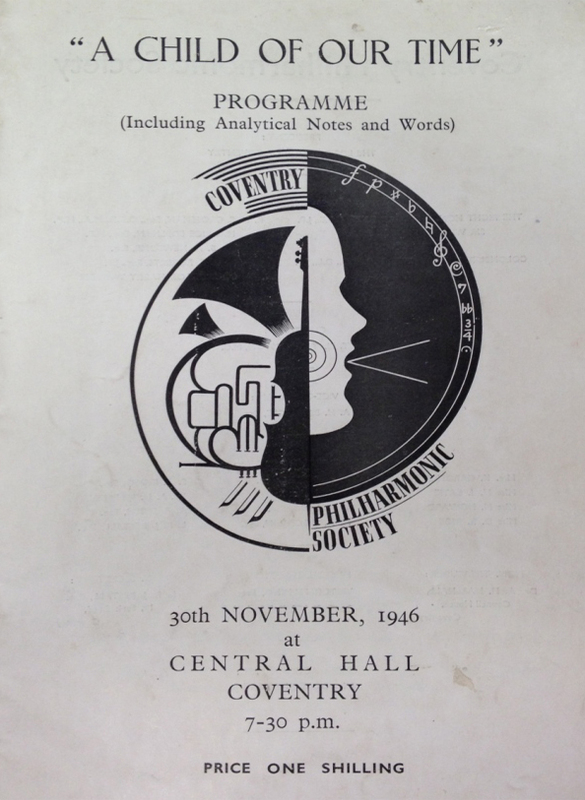 There was a Coventry Philharmonic Choir before the Second World War but its history is obscure and the Coventry Philharmonic Society, as we now know it, was formed as a charitable organisation in 1943. Within a year it had 350 members. Originally, as well as performing its own choral and orchestral concerts, it organised concerts, recitals and lectures by professional musicians. In the early days, the Society organised performances by Victor Hely-Hutchinson, The Halle Orchestra, Moiseiwitsch, the Dolmetsch family and Myra Hess, probably with generous subsidies from the Arts Council or its war-time predecessor. In 1951, the “Phil” performed with the London Symphony Orchestra. The Choir gave the first public performance in Britain of Karl Orff’s Carmina Burana and some of our members sang in the world premiere of Britten’s War Requiem to mark the consecration of Coventry Cathedral in 1962. By the late 1960s most of these activities were discontinued and the Society had become synonymous with the Coventry Philharmonic Choir. The Choir has collaborated with a number of European choirs, hosted choirs from Italy, France and Germany, and performed in Normandy. 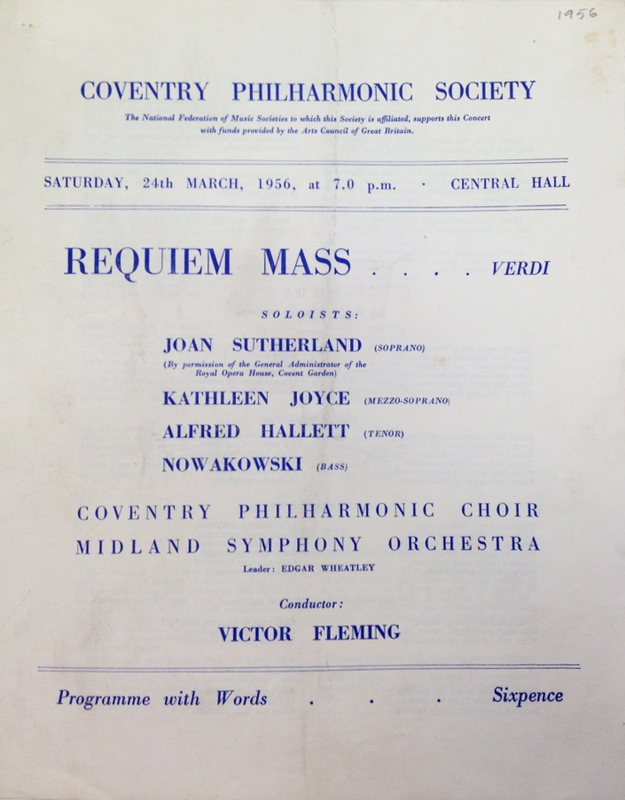 During its long history, Coventry Philharmonic Choir has been associated with some internationally renowned singers, such as Janet Baker, James Bowman, Ian Caddy, Benjamin Luxon, Norma Proctor, Joan Sutherland and Robert Tear, and more recently Timothy Travers-Brown, Emily van Evera and William Berger. It has encouraged young local singers and instrumentalists, and within the last few years, several of our younger singers have won choral scholarships to universities including Cambridge University. More recently we have founded the Coventry Singers to explore more contemporary music genres, and the Singers also now give regular concerts and recitals in a variety of formal and informal venues. The Publicity Committee recently explored the Coventry Philharmonic Choir archived records held as part of the city’s social history at the Herbert Art Gallery and Museum in Coventry. These records represent a fascinating, and often entertaining, snapshot of each decade since WWII and the integral relationship the “Phil” had, and which it continues to have, with the city of Coventry.